"Was it just me or was that guy kinda cute?" The above info came from Jennifer Johnson, and was edited by yours truly (contact me). The image came from Wikipedia. Ty Lee is an optimistic and slightly light-head young Fire Nation gymnast. She is the daughter of a nobleman and grew up at the Fire Nation royal court. She attended the Royal Fire Academy for Girls with her friends, Azula and Mai. Ty Lee is a skilled hand-to-hand combatant and has great knowledge of human pressure points which she's used throughout the series. By striking a bender's pressure points she is able to disrupt the victim's chi flow and temporarily remove their ability to bend. She did this to Katara while in Omashu, and to a group of skillful earthbenders near Ba Sing Se. She has also paralyzed Katara's arms completely, along Sokka's arms and leg. She is also able to tell the moods of people by looking at their aura or feeling their chi. 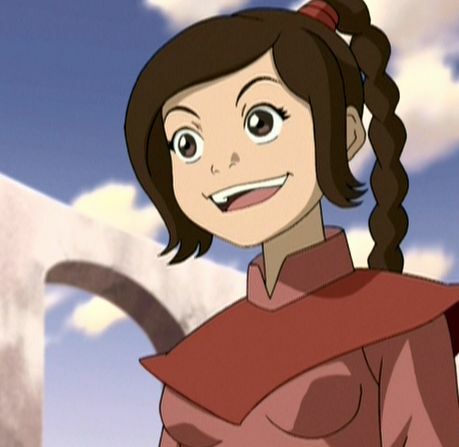 During a flashback in "Zuko Alone," she is shown to be a great gymnast and acrobat as she does a series of cartwheels and somersaults at which Azula fails. Because of this, Azula pushes Ty Lee down trying to upstage her. Though she was clearly annoyed, that does not stop her from happily going along with Azula's plan to humiliate Mai and Zuko, on whom Mai has a crush. After Azula creates a situation in which Mai and Zuko fall into a fountain, Ty Lee teases the pair about being "cute" together. In another episode, "Return to Omashu", Ty Lee has run away to join the circus, but Azula tracks her down and tries to recruit her to assist with the capture of the now-fugitive Zuko and Iroh. Ty Lee on the other hand wants to stay at the circus, claiming that her "aura has never been pinker!" Azula in a seemingly friendly way, tells Ty Lee that she will be attending her performance before leaving. Ty Lee seems rather uneasy about this. During the performance, Azula orders the Ringmaster to set ablaze the net beneath the tightrope that Ty Lee is walking on and to release all the dangerous animals making it so that if Ty Lee fell she would either be scorched by the fire, or devoured or trampled upon by the animals. After the performance, Ty Lee informed Azula that there wouldn't be a show the next day, due to the fact that, "the universe is giving me strong hints that it's time for a career change." When Mai later asks her about the circus being her calling, Ty Lee notes that "Azula called a little louder." Ty Lee accompanies Mai and Azula when they go to make a hostage trade (King Bumi for Tom Tom) and, after Mai calls the trade off at Azula's suggestion, she acquits herself well in the ensuing battle using her chi-blocking to disable Katara's Waterbending. Later, when they're leaving the city, Ty Lee, much like in childhood, teases Mai about her affections for Zuko, noting that it will be "interesting" for Mai to see him again. The above description came from Jennifer Johnson, and was edited by yours truly (contact me).